Tua Tagovailoa of the Alabama Crimson Tide looks to pass against the Louisiana Ragin Cajuns on Sept. 29, 2018, at Bryant-Denny Stadium in Tuscaloosa, Alabama. Alabama is already bowl eligible. Crimson Tide quarterback Tua Tagovailoa has yet to take a snap in the fourth quarter through six games this season. The seventh week of the college football season has many questions. Journalists/wannabe college football insider Mark Bergin tries to answer some of them. What’s your tweet-length reaction to Week 6 of the college football season? Alabama became the first team to become bowl eligible this season, and Crimson Tide quarterback Tua Tagovailoa has yet to take a snap in the fourth quarter through six games this season. 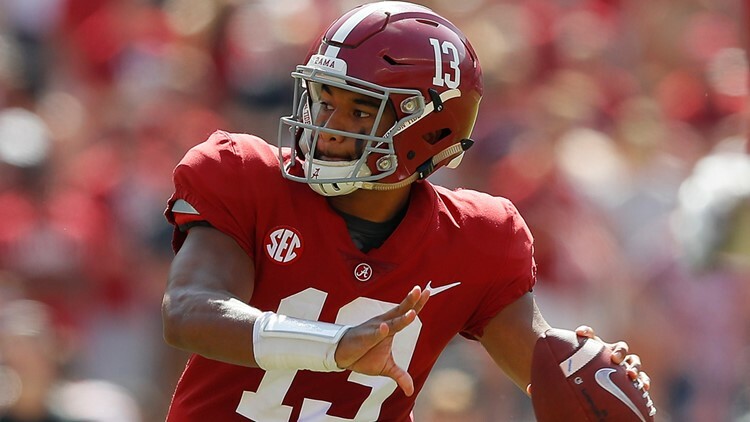 Will Alabama quarterback Tua Tagovailoa play in the fourth quarter this week? Missouri ranks 116th in total pass defense among 129 total FBS teams. The Tigers have given up an average of 39 points per game in their three games this season against Power Five conference teams. Alabama has yet to score fewer than 45 points in a game. The Crimson Tide’s lowest margin of victory is 22 points. It’s amazing to me that Alabama is only a 28.5-point favorite against Missouri. If Bama fans need a little more excitement, let Butch Jones coach for a couple of games. Which undefeated team is most surprising so far? Some might point to Notre Dame or West Virginia, but I’m going with the N.C. State Wolfpack. Can you imagine if N.C. State upsets Clemson on the road next weekend? Both teams have a bye week before their Oct. 20 matchup. If N.C. State somehow beat Clemson next weekend, I can already envision how pundits will be outraged to even consider the Wolfpack as a legitimate contender. Hurricane Florence canceled N.C. State’s matchup against West Virginia on Sept. 15. Instead, the Wolfpack will play East Carolina on Dec. 1 to make up for the canceled game. Hurricane Florence having a potential, although unlikely, impact on the College Football Playoff is a completely underrated storyline that no one is talking about! ESPN’s College GameDay heads to Ann Arbor this weekend for Michigan versus Wisconsin. Which team will Lee Corso pick? Bergin: Somehow, oddsmakers favor Michigan by nine points in this game. While at Michigan, Jim Harbaugh has a 1-1 record against Wisconsin. Michigan leads all teams nationally with only 230.5 yards allowed per game. The Wolverines will have to slow down Badgers running back Jonathan Taylor, who leads the nation in rushing at 169.8 yards per game. Taylor -- who is only a sophomore -- is quickly joining an elite lineage of Wisconsin running backs, including Ron Dayne, Melvin Gordon, Montee Ball and Anthony Davis. I think Corso picks the underdog and takes Wisconsin. Note: The AP poll was used for the rankings in this story.